GUI for editing metadata in PNG images. Is there a better alternative to PNGCommentator? Is PNGCommentator really the best app in Author Tools category? Will PNGCommentator work good on macOS 10.13.4? 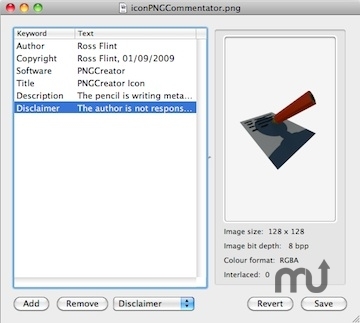 PNGCommentator is a simple GUI tool for creating and editing metadata in PNG image files. Using PNGCommentator, standard or custom metadata fields can be created at the click of a button and information can be typed directly into them. PNGCommentator needs a review. Be the first to review this app and get the discussion started!